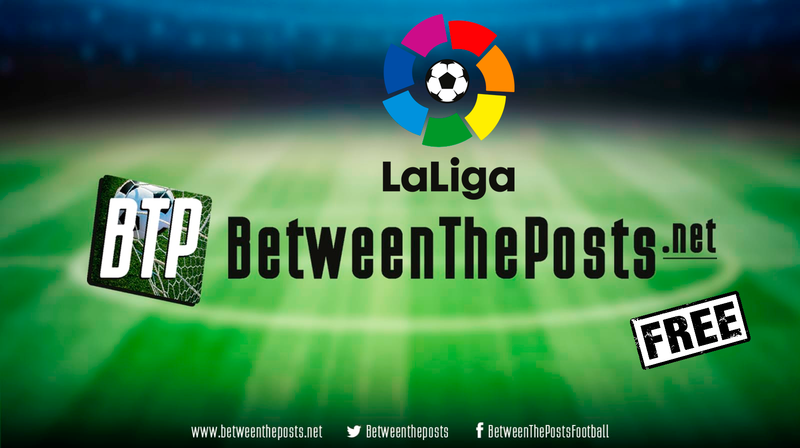 In part one of our mid-season LaLiga review, we’ve looked at this season’s under and overachievers to try and explain the extreme competitiveness in what is otherwise known as quite an uncompetitive league. Today, we are going to focus on teams that made impressive strides forward this season, and teams that clearly failed to live up to expectations. As we will see, this will be a story about managerial fit and management of expectations. Oh, and a title race that may be more of a title race then we actually think. At first glance, it may seem hard to spot the similarities here. Sevilla, Leganés, and Espanyol are three teams with very different budgets, players profiles and playing styles. What do they have in common, then? All three switched managers over the past summer and all three have seen improvements in their underlying numbers compared to last season. 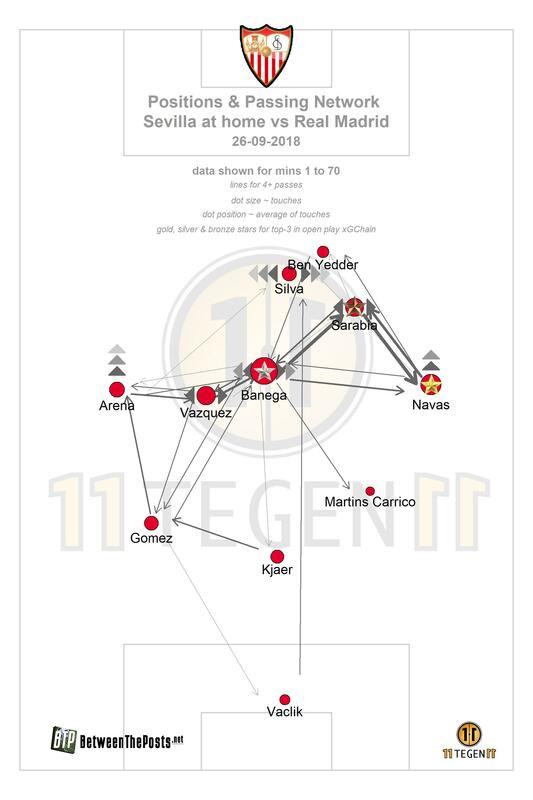 Machín himself also adapted, tweaking his 3-4-2-1 shape into a 3-5-2 that took advantage of the complementary Silva – Ben Yedder striker duo. For years, Machín had played with only one striker, until showing a bit of flexibility at Sevilla. The synergies between this group of key players have created the second most productive offense in the league, which was the main driver behind Sevilla’s current fourth place in the table. Sevilla’s typical 3-4-2-1 formation in action. Leganés had to replace the outgoing Asier Garitano, who left to join Real Sociedad. During his five years at Leganés, Garitano had designed a strong defensive team based on a well-drilled medium block A medium block refers to a team that retreats in their own half out of possession, generally only disrupting their opponents some way into their own half. and pressing traps. A pressing trap is a predefined plan to leave a particular player or zone open, to invite a specific pass. Upon a pass to that player or into that zone, a rapid coordinated team press on that player or zone is exerted. With a squad built specifically with defense in mind, Leganés had to choose a manager who prioritized defensive tactics and counterattacking football, too. Thus, they hired Argentinian manager Mauricio Pellegrino, who is well regarded in Spain for his work with Alavés during the 2016/17 season (less so for his 2017/18 struggles with Southampton). Compared to last season, Leganés has improved in terms of underlying numbers, being top seven in the league when it comes to expected goals conceded. Results, however, have not being as strong as their underlying numbers due to finishing inefficiencies on either end of the pitch. With the table as close as it is, eleventh placed Leganés is not far off the relegation spots, but it is undeniable that they are a stronger collective unit. Leganés typically operate in a direct manner from a deep compact formation. 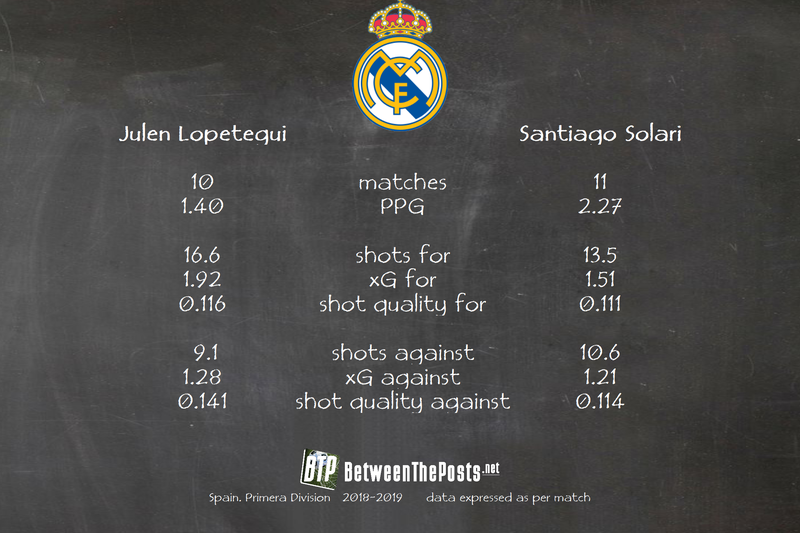 Finally, we have the curious case of Espanyol. Last year they were a solid mid table defense-first side managed by Quique Sánchez Flores, but they finished the season way too close for comfort to relegation spots. Instead of reinforcing the squad further, the Espanyol board opted to part ways with Flores and appoint Joan Francesc Ferrer ‘Rubí’ as manager. This appointment indicated a desire for a switch of style, since unlike Flores, Rubí prefers a proactive style of play based on possession and pressing. 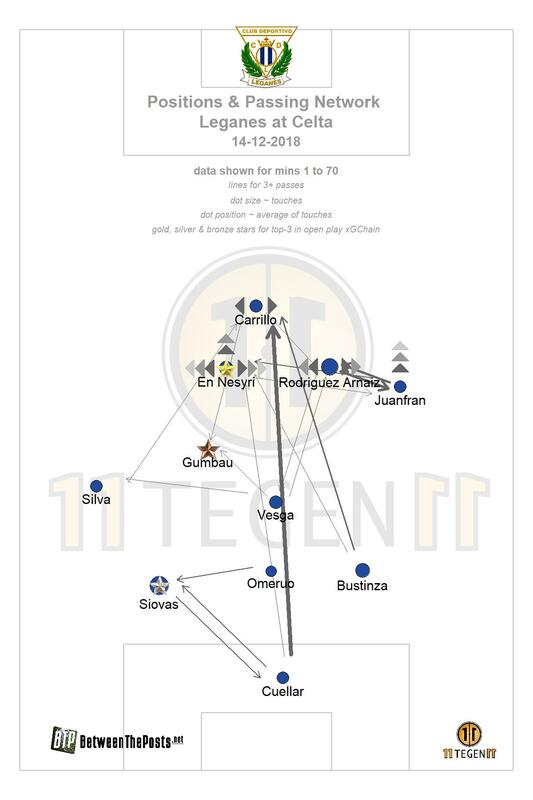 Rubí took advantage of some technical midfielders who were underutilized under Flores: Esteban Granero, Óscar Melendo and above all, Marc Rocá. Espanyol started the season strongly, remaining in European spots throughout the first fifteen match days. However, the last two months have seen them decline significantly both in terms of underlying numbers and efficiency, to the point where a meagre seven points from their last twelve league matches have seen Espanyol slip all the way down to twelfth, just five points from the relegation zone. All in all, Sevilla and Leganés are great examples of how choosing a manager whose philosophy fits the squad can lead to quick improvements. Espanyol, with ‘Rubi’ intended to switch style, but looked – at least initially – to have a squad that would fit this transition. On paper, matching managerial style and squad qualities seems like an obvious point, but as we will see in the following section, finding the right manager is sometimes not as obvious as it seems. On paper, Celta de Vigo and the two Basque giants—Real Sociedad and Athletic Club—have the squad talent and resources to be fighting for the European spots. However, this season they have all struggled to fulfill such expectations, with Athletic and Celta even descending into relegation spots a some points of this season. All three teams started the season with new managers, but unlike the cases we studied in the previous section, they struggled to build coherent collective units. In the case of Athletic, appointing manager Eduardo Berizzo seemed obvious. Athletic thrived under the legendary Marcelo Bielsa between 2011 and 2013, and Berizzo was one of his closest pupils. However, we soon discovered that the philosophy that worked so well six to seven years ago might not be ideal now. Following the tenets of his teacher, Berizzo opted for a tactic based on high pressing, man marking and possession, which proved too exhausting for the players. Athletic often showed excellent first half performances (including those against Real Madrid and Barcelona), only to slip during the second half as the tiring team proved unable to execute the press. Both results and underlying numbers for Athletic were worthy of a bottom five club, and they descended into the relegation zone. Berizzo was fired and Gaizka Garitano – former manager of Eibar – was appointed instead. Athletic then shifted to a 4-4-2 medium block, A medium block refers to a team that retreats in their own half out of possession, generally only disrupting their opponents some way into their own half. more directness, and a more zonal defending approach. All of this seemed to fit the squad much better. Results and underlying numbers have improved significantly, with a spectacularly low amount of expected goals conceded and yesterday’s complete stop of Barcelona’s offense a particular highlight. Athletic is finally moving away from the relegation zone now. 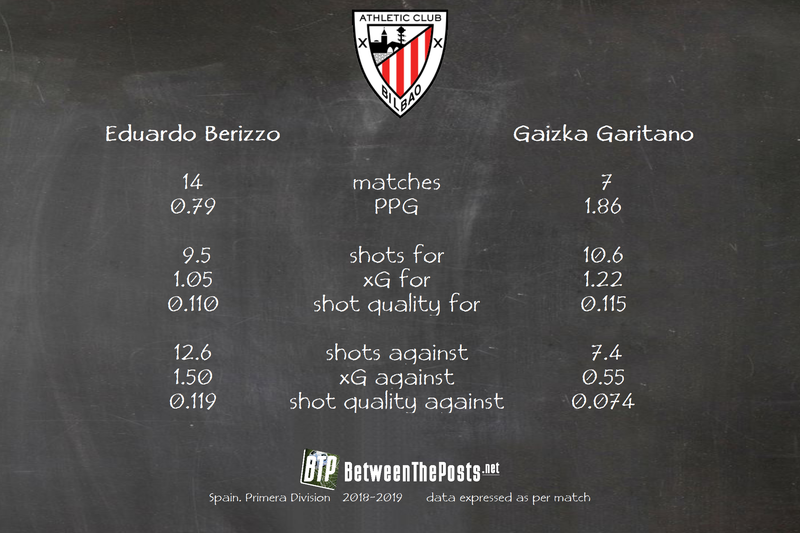 Athletic’s improved numbers under Gaizka Garitano. Athletic’s Basque rival, Real Sociedad, had a similar story of a manager who did not fit. After years of playing proactive football under Eusebio Sacristán, they surprisingly appointed the defensive-minded Asier Garitano as a manager. Garitano successfully turned Real Sociedad into one of the stronger defensive units of LaLiga – top three in expected goals conceded – but the team’s offensive mechanisms never fully developed. Sociedad’s squad lacked the kind of physical midfielders and fast attackers often required to build a strong counterattack, so adaptation to Garitano’s attack style would always have taken time. It looks the Sociedad board was not prepared to wait for that transition to take place. Tired of seeing Real Sociedad linger in the bottom half of the table, they fired Garitano by December. Given Sociedad’s decent underlying numbers, this seemed like a debatable decision, but caretaker manager Imanol Alguacil has actually deployed a more proactive, possession-based style that fits the squad better. Sociedad quickly shot up to the top half of the table. Finally, we have the strange case of Celta de Vigo. They have built a squad with many talented attackers—Iago Aspas, Maxi Gómez, Pione Sisto, Brais Méndez—but have surprisingly failed to scout equally talented defenders and goalkeepers. This deficit has stumped all of Celta’s managers over the last eighteen months: Juan Carlos Unzúe (possession & pressing philosophy), Antonio Mohamed (defense & counterattack) and current manager Miguel Cardoso (possession & pressing). To make things worse, none of these managers succeded in creating attacking systems that fully optimized the use of their talented attackers. In the case of Celta, we still do not exactly know what their ideal manager and philosophy look like. 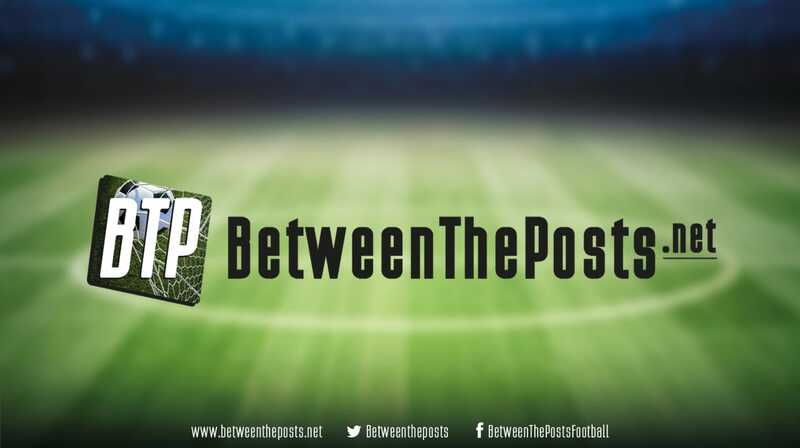 The title battle: is the traditional top 3 in decline? Now, we move on to Atlético de Madrid, Real Madrid and Barcelona, the teams who have topped LaLiga for all of the past six seasons. Their usual dominance over the league was put into question during the early stages of the season, with all three accruing fewer points than they did in previous seasons. In the case of Atlético, this underperformance was the result of severe offensive structure issues. They are a very direct team who depend heavily on their center forward for attacking mechanisms, and the poor form of striker Diego Costa hit them hard. Atlético’s set piece game has traditionally been a very important weapon under Someone, but this season the teams ranks a meagre tenth in expected goals created from set pieces. In the case of Barcelona, the team initially experienced serious defensive issues in the first quarter of the season. Manager Ernesto Valverde tried to build a team that featured both Ousmane Dembélé and Philippe Coutinho in the starting eleven and it can be said that this experiment failed. Barcelona had no issues scoring goals but playing with four attackers was too much for the team’s defense to carry. This results in an immense vulnerability to counterattacks, due to poor attack-to-defense transitions. Barcelona struggled to slow down and control games through possession, and the aging Piqué, Busquets and Rakitić had to cover way too much ground to defend counterattacks. In response, Valverde has opted to always keep one of Dembélé or Coutinho on the bench and use an additional central midfielder (usually Arthur Melo or Arturo Vidal) instead. 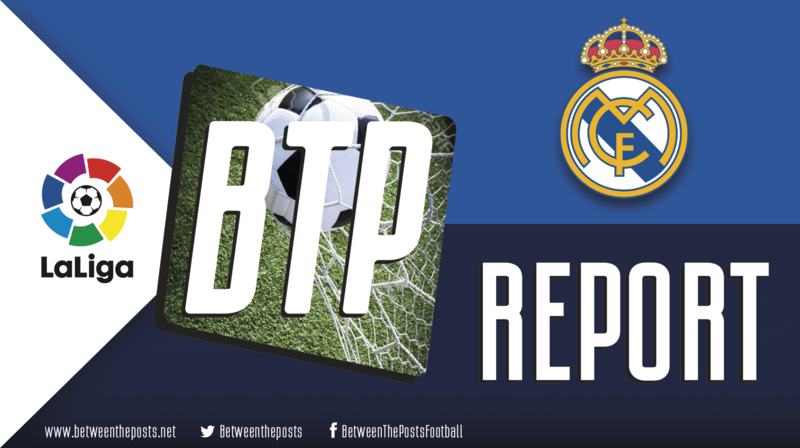 While both Atlético and Barcelona have reverted to their usual underlying numbers and are now accumulating points at the usual rate, Real Madrid’s problem is harder to solve. They have seen a massive drop-off in their expected goals created since the departure of Cristiano Ronaldo. Real Madrid went into the season with high hopes. New manager Lopetegui hoped to install the patient buildup style of play that brought him success at the Spanish national team. However, his tenure was cut short after a disastrous defeat at Barcelona, as the culmination of a series of disappointing performances and ditto results. Real went on a streak under Lopetegui’s successor Santiago Solari. Interestingly, Real’s underlying numbers have hardly improved. In fact, defensive numbers have remained sub-par, while the offensive output has even deteriorated. All of this does not bode well for the chances of the improved results to continue over a longer period of time. All in all, after yesterday’s draw at Athletic, Barcelona have a gap of six points to Real Madrid and seven points to Atlético. On top of that, they also have by far the better underlying numbers. The combination makes them overwhelming favorites for the title. 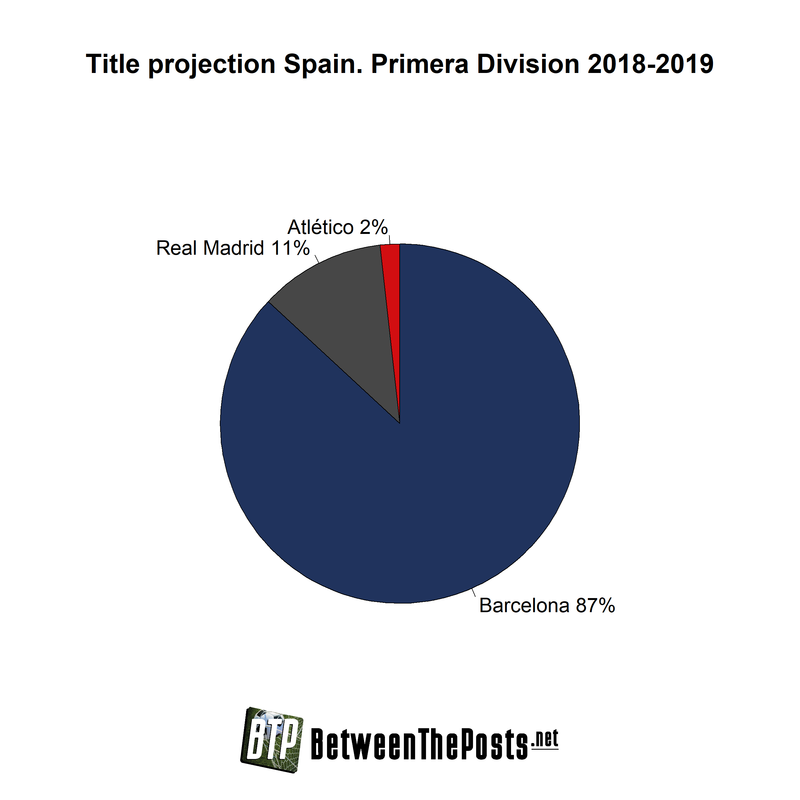 Yet, with sixteen matches still to play, and Barcelona’s offensive catastrophe against Athletic still fresh in mind, challengers Atlético and particularly Real Madrid may just play themselves in contention once again.